April 3rd, 2016 was a day where two beautiful angels, Alana and Carly, were present at the Indian River Inlet watching over their parents. Alana Rose Prettyman was born on September 14th, 2014 and eight months later she was diagnosed with a terminal and rare illness. Her father, Kyle Prettyman, and mother, Alexa Shoultes, stayed by her side until December 16th, 2015 when her heart stopped beating in her mother’s arms. She now lives with the Lord and visits her family regularly. Carly Marie Weiss is the daughter of Maria and Dalton Weiss and little sister to Bradley Weiss. Carly Marie was born on December 4th, 2015 and was suddenly called home to be with the Lord on March 21st, 2016. This is my amazing story of how two little girls, now in heaven, made sure their parents were safe on April 3rd. This was the day we would paddle out into the inlet, as a ceremony to release a biodegradable disk that held baby Carly’s ashes. That day was so emotional, especially since the sting of losing our daughter was still so sharp. There were three other paddlers out in the water besides Mia, Dalton, and Kyle. The wind was strong and gusty. The waves were big. The water was cold, and the current was strong. This day was a little dangerous to be out in the water if you ask me, but we knew the release of her ashes had to go on. As soon as the ceremony started and the paddlers ran into the water, the waves grew and turned angry. It was a struggle for the kayak to make it past the break regardless of his experience with the water. To see the newly grieving father paddling the ashes of another innocent and beautiful child gone too soon, was heart wrenching to me. We were all eagerly anticipating the breakthrough to the calmer waters, but when it came, it was short lived. The water calmed down for just enough time for them to release the ashes and give Carly and her family the moment they deserved. So many of Carly’s friends and family were there grieving her loss. But, in the midst of heartache, the surrounding love and support was comforting. What happened next was close to a nightmare. Very soon after the ashes were released, the ocean started roaring and gave all the paddlers a challenging fight. That’s when I heard that my boyfriend, my other half, had just flipped the kayak and was lost, being carried in the water. He was not prepared to go in the water because the plan was to stay above it. I was so scared, so I ran to get as close to him as possible. “The coast guard has been called and is on the way!” said the woman on the phone who obviously sensed my panic. We were praying for all the paddlers to make it out safe. I was in a full body shake in fear of losing Kyle after losing our daughter; that would have been my everything. Minutes go by, Kyle still wasn’t out and two others were out there too, struggling to not get carried out by the current. By God’s grace Kyle made it out and the other two got rescued by the Coast Guard. In the end, everyone made it out safe, but not without panic and the loss of our kayak and a few surf boards. We knew that Alana and Carly were watching over all of us who went out to be a part of the release. It could have been fatal. The wind and current took those boards and kayaks out within a blink of an eye. We tried to find them, but they disappeared! We never thought we would see our kayak again. Amazingly, on April 13th, I got a call from the Boston Massachusetts Coast Guard Station. 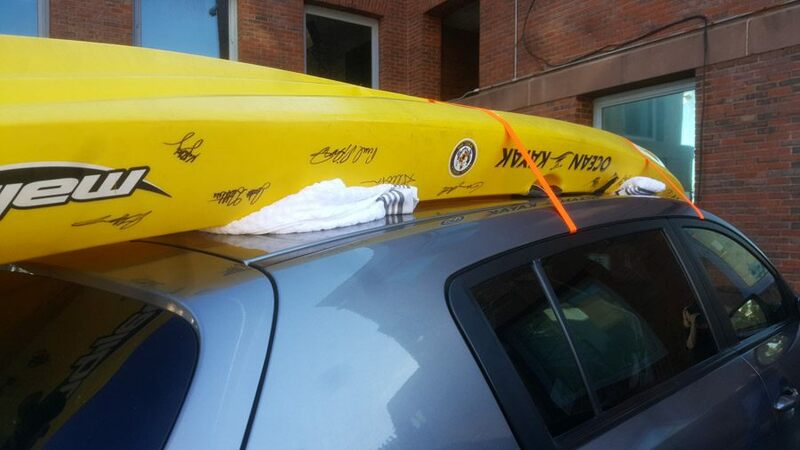 They found our kayak, ten days after we lost it! To our surprise, it was seventy miles east off the shore of North Carolina in the middle of the ocean, like a needle in a haystack. We could not believe it! The angels were still looking over us that day. The question in everyone’s mind was how did they find us?! After they pulled the kayak on board the Seneca, they used the serial number off the kayak to find the store that originally housed the kayak. The used the information on file from when we bought the kayak and found my phone number. A series of questions were asked to verify that it was ours. They continued to tell me that the ship that picked up the kayak, the SENECA, was on a law enforcement trip and was unable to release information other than they brought it on board, and it would be gone for a while. The boat had to take a trip down through the Panama Canal and around the Caribbean before returning to Boston with the kayak. We wouldn’t get our kayak back until October. All of the Coast Guard members continued to tell us that this hasn’t happened before and they wanted to know the story. We told them about our daughter, Alana, and her journey, then explained why we were out in the first place, for Carly. It’s so easy and apparent that our angels were looking out for us. Fast forward to the middle of the summer when we got invited to a NKH Conference in BOSTON! What a coincidence; or was it? So I informed the Coast Guard that we would be in Boston October 15th and we would pick it up on our way home. What they did was beyond thoughtful. 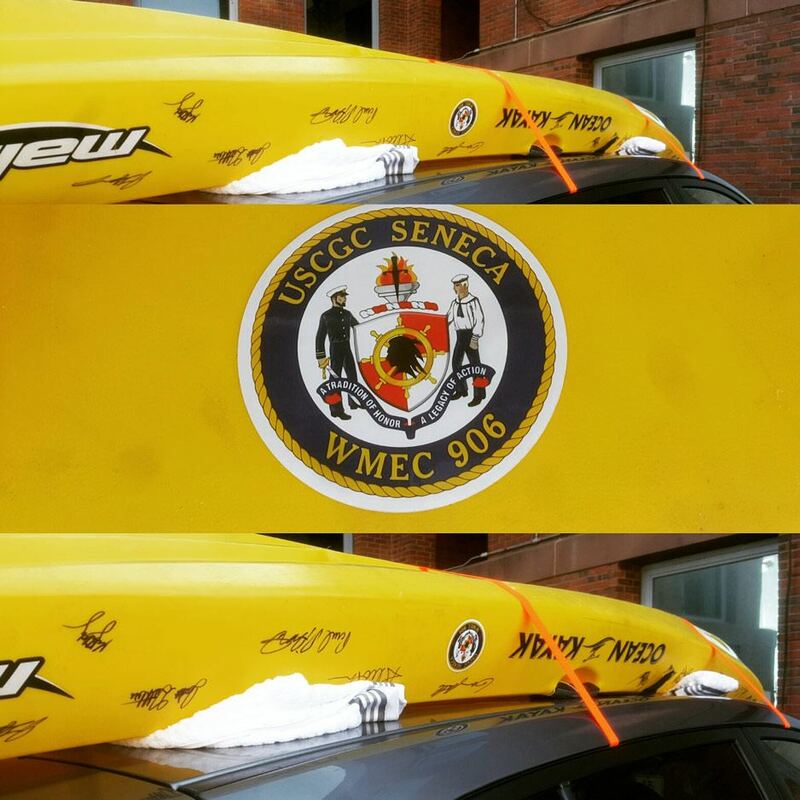 They got every crew member that was onboard the ship to sign the kayak and placed a USCGC Seneca sticker on the left side. Every one of those crew members knew the story and knew about our angels. We could only hope that our angels impacted their life in one way or another, or maybe it restored their faith in spirits and angels. Whatever the impact, our daughters made a difference, and that makes a difference for us. We boarded the ship that saved our kayak on October 15th, over five months later. All of the crew members greeted us with condolences after looking up our daughter’s story on our foundation’s webpage. We felt that they really cared about our story and Alana. One crew member asked to pray with us on board the ship; we joined her in prayer on the SENECA. There are not adequate words to thank the Coast Guard and all the crew members for what they did for us. They didn’t only give us the kayak back; they gave us memories back. They gave us reassurance that even though our girls aren’t physically here with us, they will always be near. Kyle and I went on the kayak as respite time while Alana had a caregiver for her. Now that we have the kayak back, we can go out on the water, look to the sky and talk to our angels above. Having this kayak back means more than this story can explain. I am so grateful to have all the signatures of the members that made this possible for us. 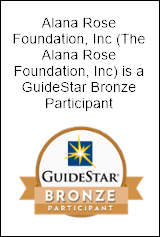 It’s another meaningful piece of the puzzle to continue Alana’s Legacy along with the Alana Rose Foundation. To close, thank you Boston Coast Guard Members for what you have done for our family. These words are a fraction of our appreciation. Our praises and thanks go to our two angels in heaven that will remain close and protect us from this day forward. Always, in loving memory of our angels, Alana Rose Prettyman and Carly Marie Weiss.